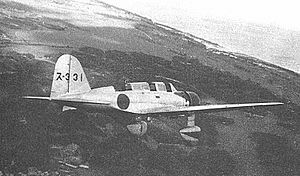 The Mitsubishi B5M was an Imperial Japanese Navy land-based attack aircraft with an Allied reporting name of "Mabel" (also known as "Kate 61"). It was designed in response to a 1935 specification for a new bomber for use on the IJN aircraft carriers. The machine was to have a crew of three, folding wings for flight deck storage, a speed of not less than 322 km/h (200 mph), a flight endurance of not less than seven hours, and the ability to carry at least 800 kg (1,760 lb) of bombs - a tall order for a single-engine aircraft of the mid-1930s. It was intended as a backup for the Nakajima B5N "Kate" torpedo bomber. Although designed as a carrier based aircraft, it was relegated to land-based torpedo bomber duties in World War II. 125 were built. The Japanese Navy designation was 九七式二号艦上攻撃機, or Navy Type 97 No.2 Carrier Attack Bomber. The "number 2" was to distinguish it from the Nakajima B5N, which was called 'Navy Type 97 No.1 Carrier Attack Bomber'. B5M1:Three-seat attack aircraft for the Imperial Japanese Navy. In the design and building of the B5M1, the Japanese obtained a great deal of useful information from an American built Northrop A5 bomber that they had purchased, brought to Japan, dismantled, and analyzed. The aircraft that Mitsubishi produced first flew in 1937 and was an all-metal, low-wing cantilever monoplane with fixed undercarriage with large wheel spats. The crew of three sat in a long canopy that had a smooth transition to the fuselage. The B5M1s began equipping Japanese Naval units in late 1937, but their performance was never as satisfactory as was that of other Japanese aircraft carrier-based bombers. The B5M1's performance was considered marginal and only 145 were manufactured. While they had originally been intended for aircraft carrier use, the majority were employed during the early months of World War II from land bases in Southeast Asia and in China, where they were confronted by weak or no enemy fighter opposition. These machines ended their careers as trainers, target tugs, and kamikazes. Francillon, Ren� J. Japanese Aircraft of the Pacific War. London: Putnam, 1970. ISBN 370 00033 1.